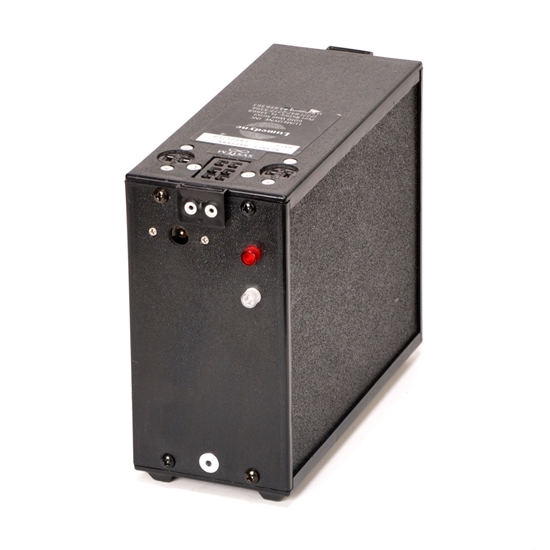 The NiCd (Nickel Cadmium) battery cells are the type that we have used since 1982. These are the best No Memory high quality cells and we build them into a monster multi-deck battery. We are the only company who actually guarantees the flashes per charge and the only company with an extended pro-rate warranty. The Extra Large NiCd Battery, BXLG is not a popular size of Battery because it is gigantic. However, it packs THE MOST performance when you want the least amount of worry about your battery during a shoot. In some cases, photographers might use one of these as the "main battery" and maybe an AC Power Adapter as the "just in case" since you just aren't likely to drain the Extra Large Battery. This is the only Battery recommended for the Extra Fast High Speed Module XSMX which has four additional pins near the six pin connecter all the Lumedyne products have. The car battery adapter and the larger AC Supply aslo have this special 10 pin connector arrangement. You can see the extra sockets in the photos. This will also fit all the normal Lumedyne stuff too. If you use 200ws we guaranty 600 flashes per charge. If you use 25ws, that same battery gives you 4800 flashes. Likewise, if you use only 400ws, you should expect 300 or more flashes from this "little" battery. The NiCd Batteries all have a 100 Month pro-rate warranty on the cells. For the Extra Large Battery, that warranty loses value at $6.00 per month for 100 months. In some cases, there may be a sale price that is a better value than the total pro-rate as you reach the end of the warranty. There is a small labor fee to install the cells and the new battery cells always start a new pro-rate warranty. The case and electronics have a Two Year warranty from when it's originally purchased.